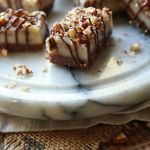 No Bake Pecan Bars With Chocolate Drizzle! 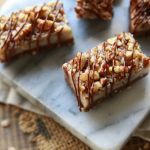 These no bake pecan bars, which are pure pleasure, with every bite, were inspired by my sweet and salty no bake chocolate peanut butter bars, that I posted last week. Let’s just say they tasted heavenly, and were gobbled up in minutes! But since sharing is caring, and they’re a piece of cake to make, I’ve already successfully refilled my freezer stash! Now, I know you’re all thinking that I’ve been on a little no bake frenzy lately, and you’re right, but I can’t help it! They’re petite, freezer friendly, and very easy to prepare. So, let’s see what’s in these no bake pecan bars. It all begins with a refined sugar free caramel layer, that sits on a thin cocoa and coffee date base. And if that isn’t already enough, I’ve topped them with toasted pecans, a drizzle of “chocolate”, and a sprinkle of sea salt. I did say they were pure pleasure to eat, did I not? But it gets better, because they also make a great freezer snack, and the best part about them is you don’t need to wait for them to thaw, as they’re ready to devour straight out of the freezer. Heat a saucepan, then add the pecans in an even layer, toss until they start to slightly color, then place into a bowl. Next, add the medjool dates, pits removed, into a food processor, and blend, until it forms a paste. Add the instant coffee, vanilla essence, cocoa powder, almond flour, and a 1/4 cup of the pecans, and blend, until combined. Transfer the base mixture into an 8 x 4 x 1/2-inch (20 x 10 x 6 cm) loaf pan, lined with baking paper, and press it down, to form an even base. For the refined sugar free caramel, heat a small pot with roughly an inch (2.5 cm) of water, and bring to a boil. Take off the heat, and add a heat proof, glass bowl, on top, making sure the bowl doesn’t touch the water. Next, add the coconut oil to gently melt, then add the maple syrup, coconut milk, and almond butter, and whisk, until all that goodness is combined. Finally, pour the caramel onto the base, and even it out with a few jiggles. Roughly chop the remaining pecans, add them on top of the caramel layer, and gently press them down. This is done to ensure they won’t fall off when we cut them into bars. Transfer the pan into the freezer for a few hours, or overnight, until hard. When you’re ready to slice, dip a chef’s knife, into a cup of hot water, dry it, then slice into 12 bars or desired size. For the chocolate drizzle, mix together the cocoa powder together with the coconut milk, and maple syrup. 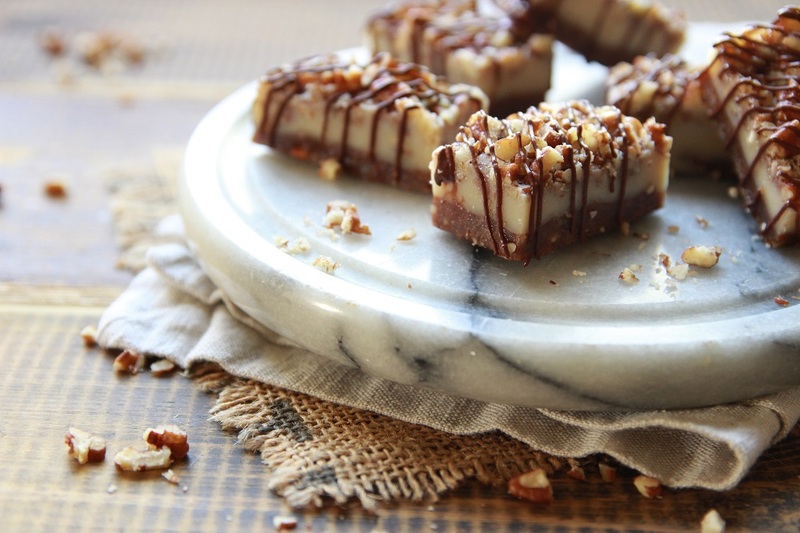 Drizzle on top of each pecan bar, and add a sprinkle of sea salt. Store them in the freezer, in an airtight container, and whenever you’re craving a sweet treat, no need to wait for them to thaw, simply take one out, and dig in! 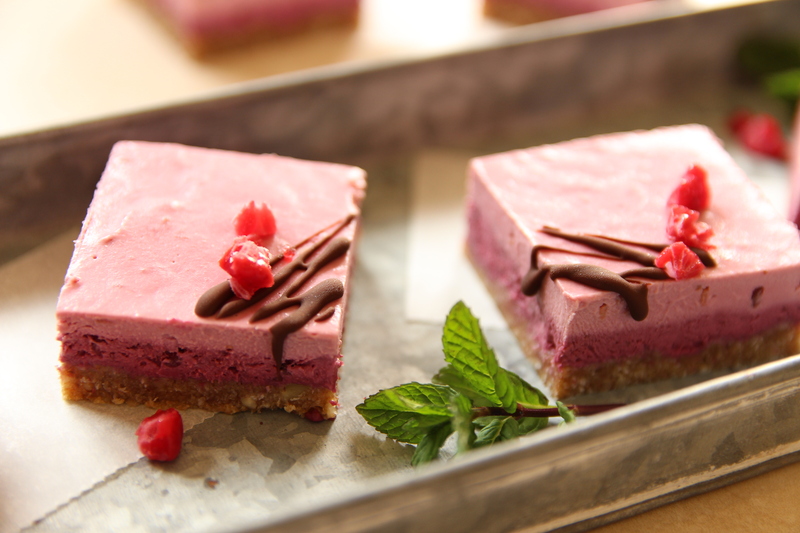 If you want to fill your freezer with more goodies, then try my Raw Raspberry Slice Bars! They’re fruity, vegan, and you don’t need to soak any cashews, to make them! ← Savory Muffins With Sage And Sun-Dried Tomatoes! These look absolutely gorgeous. Other than energy bites, I’ve still not done much with healthy (ish) no bake treats. If I could make something that looked as good as these, I might be more willing. Those look healthy, but rather naughty! I’m in!